When you have a craving for something “good” yet do not wish to overindulge, South Indian is the cuisine to go for. The crispy golden-brown dosas paired with sambar, and delicious nariyal chutney on the side make for a yummy and healthy meal. 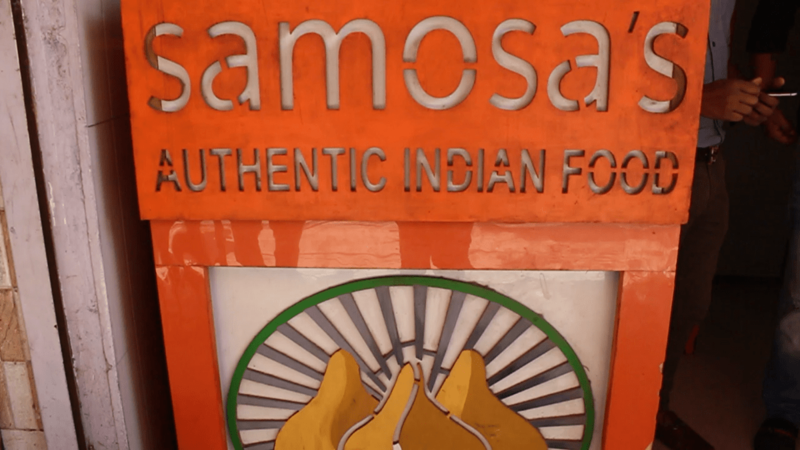 Dosa, originally from South India, has made a place for itself in the hearts of Delhiites. 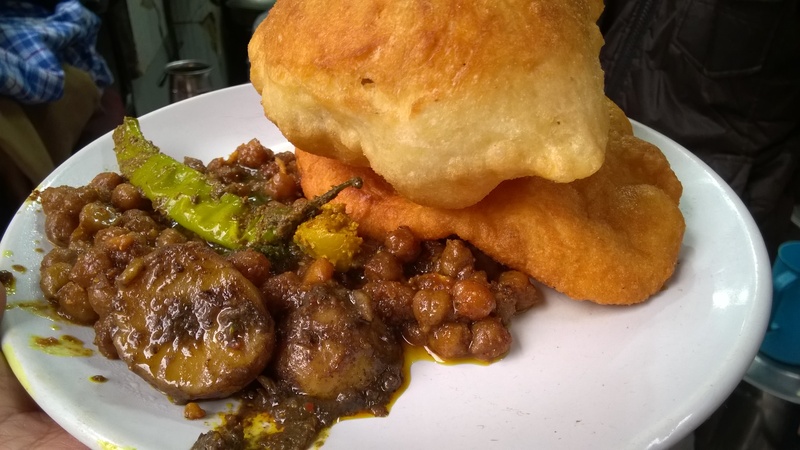 One can find multiple outlets, from well established, dine in restaurants like Sagar Ratna, Udupi, Saravana Bhawan, to their cheaper counterparts, street vendors, all around Delhi. Mysore Cafe, located in the serene and beautiful South Avenue area, is a pure vegetarian cafe which serves South Indian dishes. 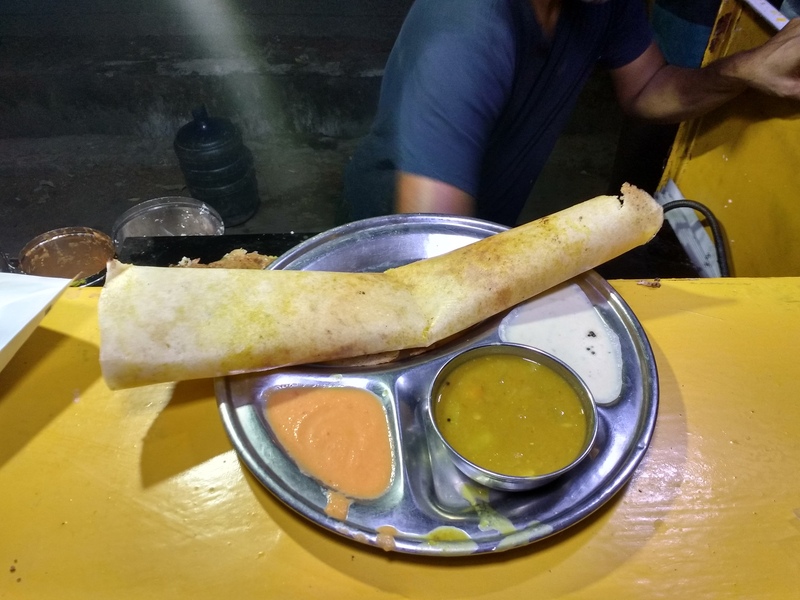 This cafe, a popular breakfast spot among cyclists, offers a range of dosas stuffed with fillings like potatoes, onions, which are served with the staple sambar and chutney and can be paired with tea or the famous filter coffee which is served in a steel glass. Their speciality is the fusion, Bombay dosa which is stuffed with cheese and pav bhaji masala to add that touch of Bombay and is paired with equally delicious nariyal and tomato chutney. This quaint little cafe, located close to India Gate, has a wonderful ambience and is much loved by the locals for its authenticity and taste. 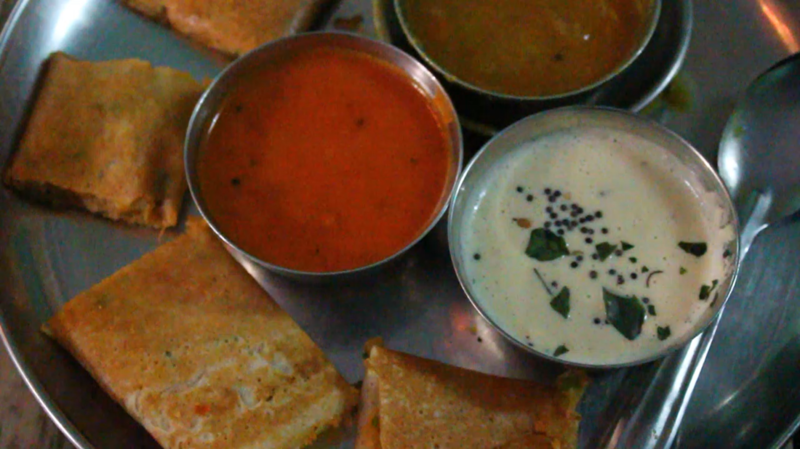 They also sell uthappam, vada, idli, etc, all at a reasonable cost and have generous servings. The cafe has been in business for the last 46 years and is currently owned by RJ Deepak, a friendly and humble guy. It is easy to locate and can be reached by metro, the closest metro station being Udyog Bhawan. This year, Mysore Cafe, in order to not limit themselves to South Avenue area has participated in the NBT Flavour Fest- Street Fusion Food Court taking place at Baba Kharak Singh Marg on the 14th and 15th of October. 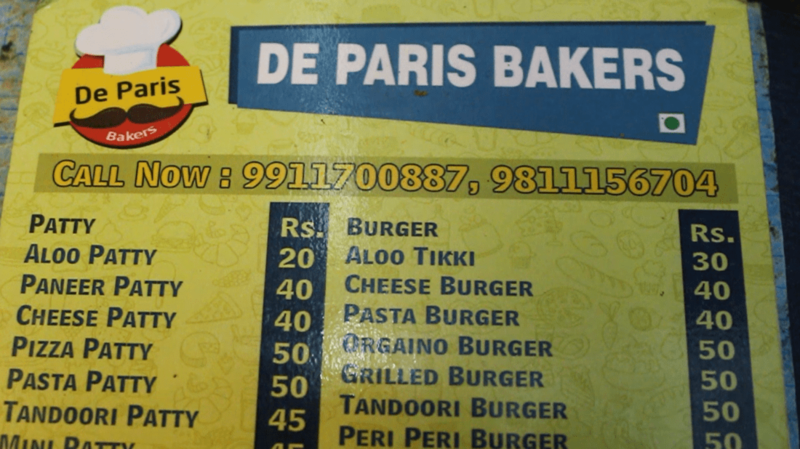 If you consider yourself a foodie, you cannot give this a miss. The festival is curated by Delhi Food Walks and aims to bring to the forefront the talented minds behind the various fusion food items. Omelette, etymologically a French word, has since been modified and its variants, like the frittata or the Greek omeleta, can be found across the world. 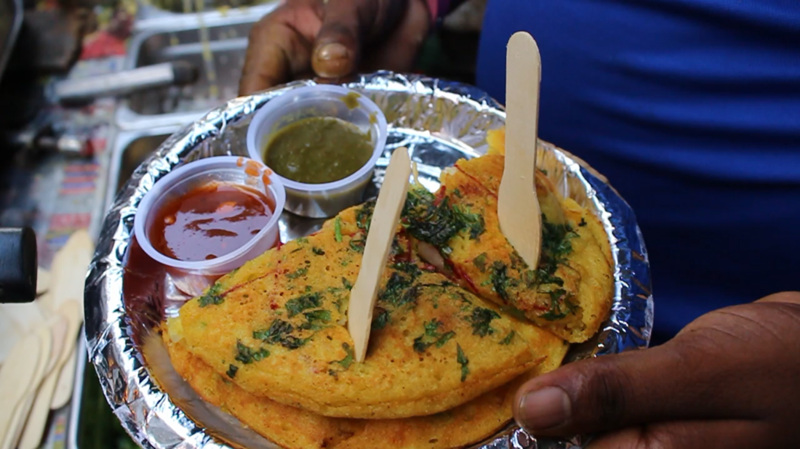 In India too, the vendors of Delhi, have taken the omelette up a notch. The staple ingredient of every household has been spruced up to give us the pizza omelette. 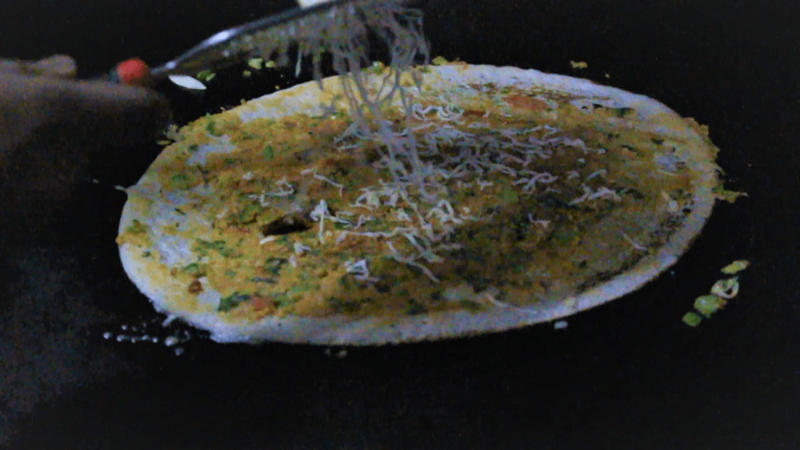 Pizza omelette, a crossover between a pizza and an omelette, has become a speciality of Dwarka Sector 7. One can find many street food vendors selling the same, however, the one sold at Ramphal Chowk by a stall named Rajiv Bhai ki Spl. Pizza Omelette is truly a delicacy. 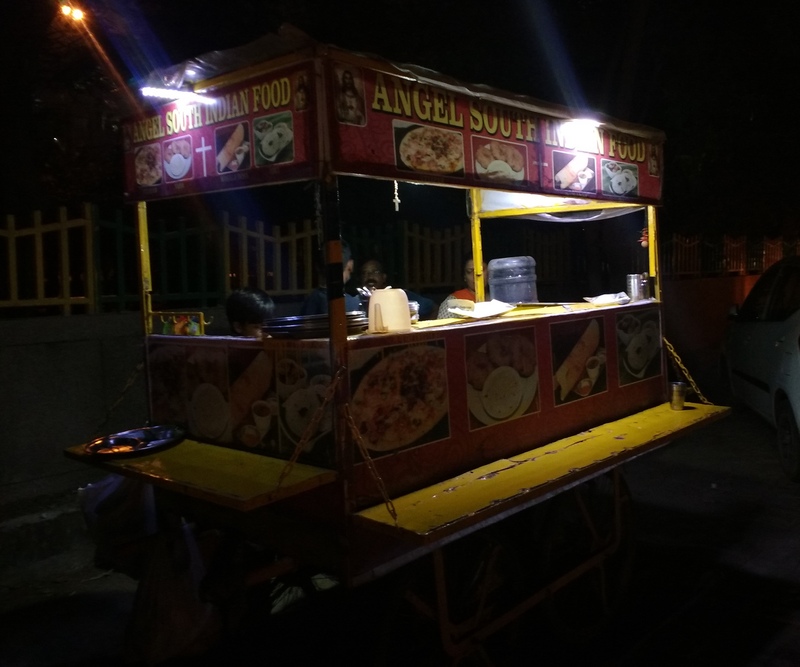 The stall is owned by Shiv Kumar who has been doing the same for the past 3 years. People from the neighbourhood start lining up at his stall as soon as it opens. 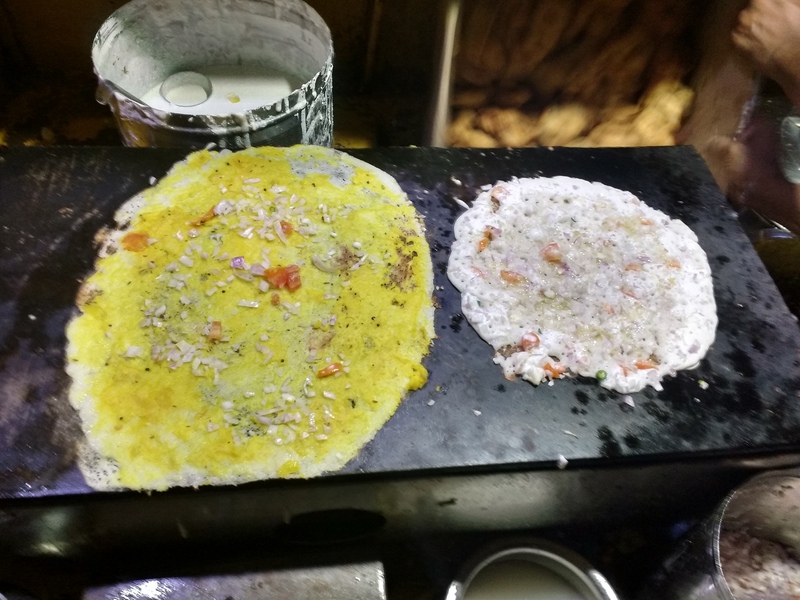 He also sells various other sorts of omelettes including cheese, chicken, paneer and even dry fruits. 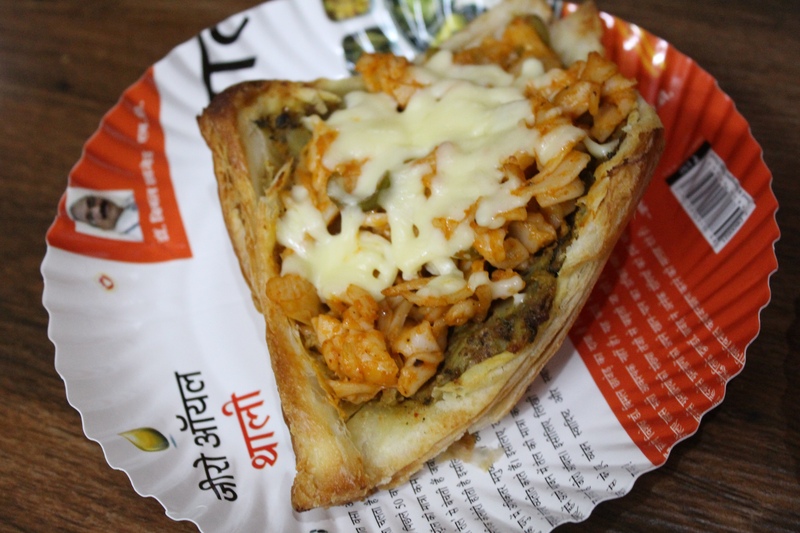 Shiv Kumar sets up his stall at 3 pm and serves till 11 pm, making for a great evening snack. 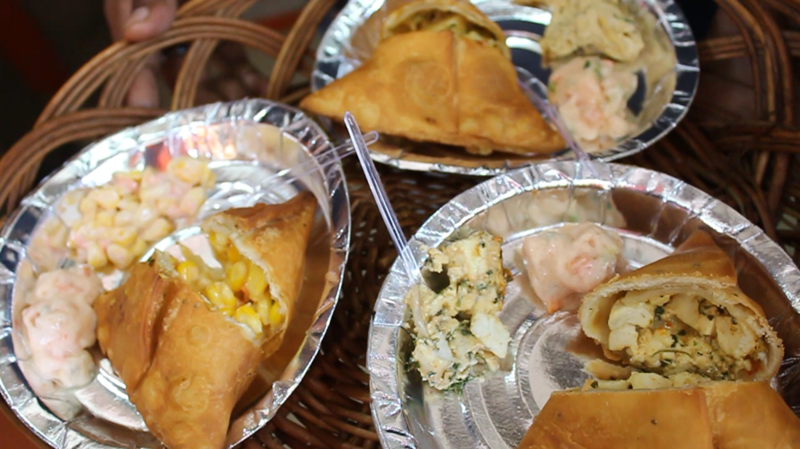 The stall is easy to spot, being quite popular in the locality and can be easily reached by metro. 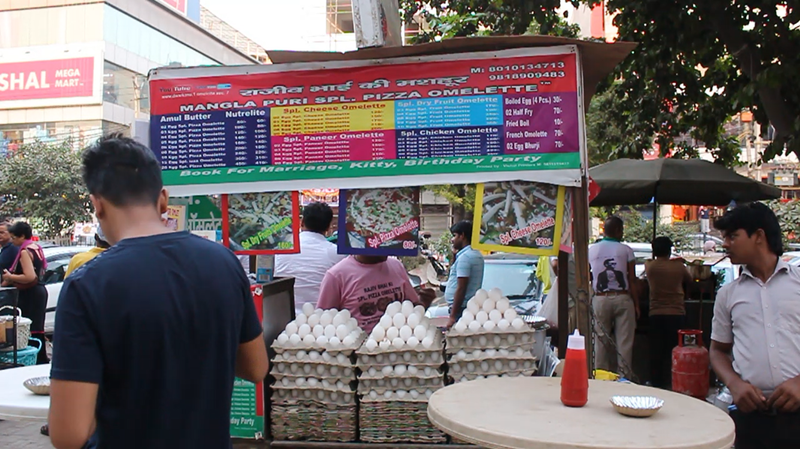 The pizza omelette is prepared live and its price varies from rupees 80-240, depending on the number of eggs used to make the omelette, going upto 10 eggs. The omelette is first cooked in large quantities of butter, either in Amul butter or its healthier alternative Nutralite, then stuffed with tomatoes, onion, ginger, and chillies, and later 4 slices of bread attached to it while cooking. So far, the dish looks pretty basic and simple, however, what follows, makes it stand apart. 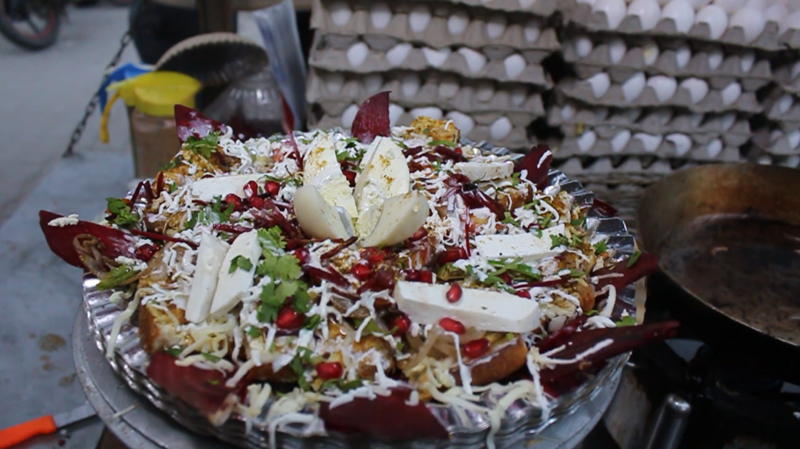 The omelette is finished off with toppings of liberal quantities of grated cheese, cream, beetroot, paneer, pomegranate, and fresh coriander. The finished product truly looks like a pizza and as you dig in, you’ll discover the variety of ingredients used in the making. The pizza omelette is served with two types of chutney, and a little salad on the side. 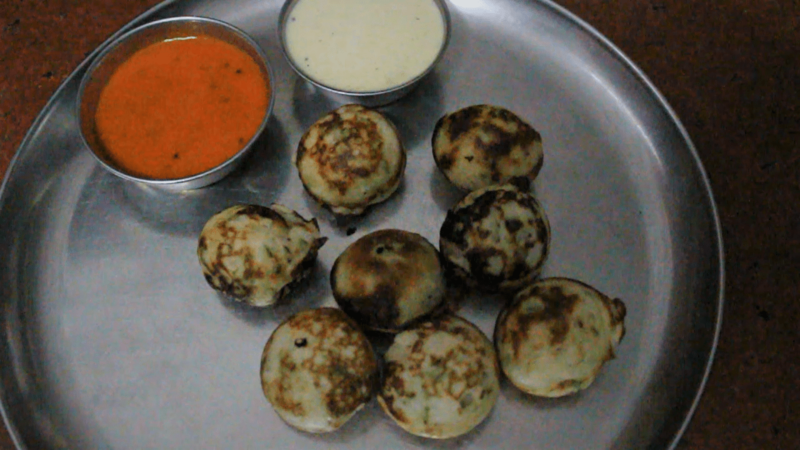 If you are looking for an indulgence and do not mind the calories, this is the dish to go for. This year, Rajiv Bhai ki Spl. Pizza Omelette is trying to give every Delhite the taste of their special pizza omelette by being a part of the NBT Flavour Fest- Street Fusion Food Court taking place at Baba Kharak Singh Marg on the 14th and 15th of October. The festival is curated by Delhi Food Walks and aims to bring to the forefront the talented minds behind the various fusion food items. Everyone always ignores the small tea stall on the side of the road or at the corner of a street. No one knows the history behind a small tea stall. 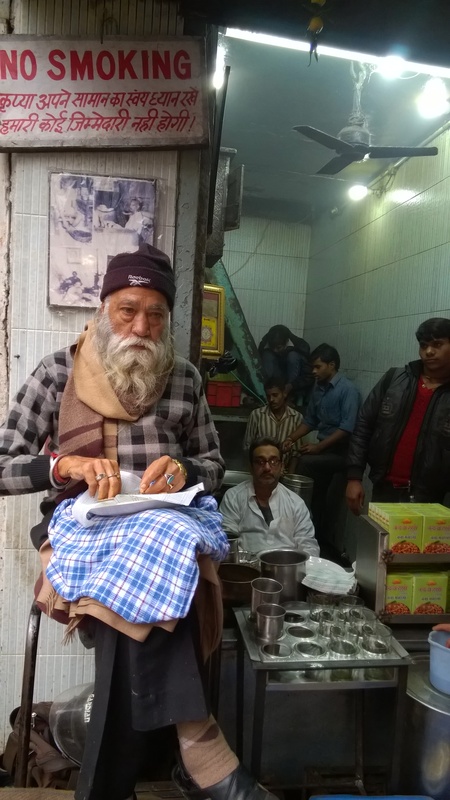 Even Shah Rukh Khan’s father had a tea stall and served tea at a very well known drama company in Delhi, and if it was not for the star, we would probably never have known that such a tea stall existed. Likewise, there is an old tea stall in the lane of Gali Qasmijan, right at the entrance of Phatak Luharu in Ballimaran. 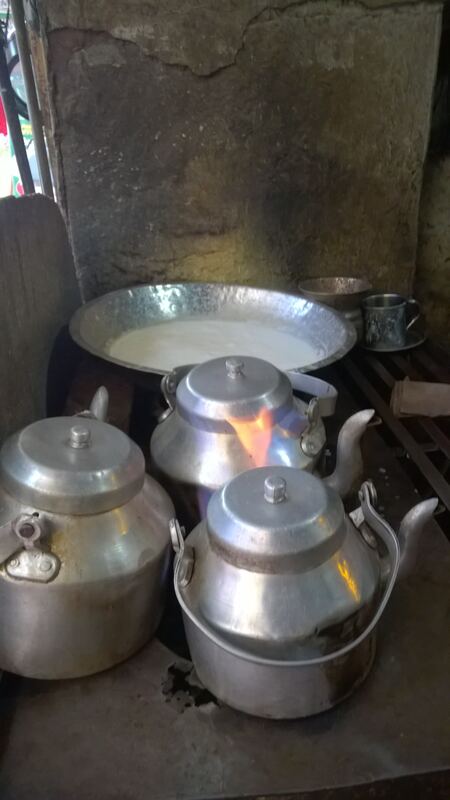 This tea stall was started by the late Haji Mohammed Farooq in 1969, carried on by his son the late Mohammed Yahya. It has been forty-five years since the pouring and serving of tea has been going on here. Now, the grandchildren, Mr. Farhan and Mr. Faizan, who are reporters with a newspaper, are still taking care of their family business. 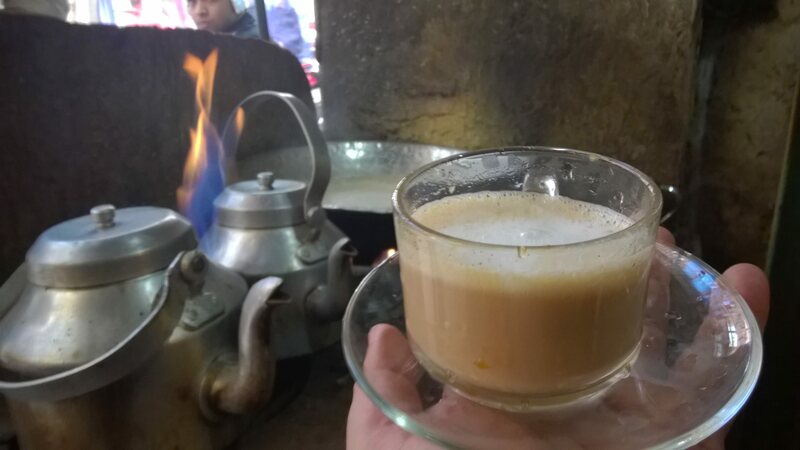 Their father, the late Mohammed Yahya, also owned a dairy shop named after his wife, Sabra and a hotel where the tea famously known as “Haji ki Chai” was served. Since the grandchildren did not have the same aspirations as their father, they gave up the place for rent and but have still kept the touch and name of their father through the tea stall. When I looked at the boys preparing the tea, I was completely amazed at how it was being prepared. It was nothing like the way we prepare it at home. The tea leaves are boiled in water in an aluminum kettle for a long time and on the other side, the milk is kept boiling, letting it form a layer of cream, commonly known as malai. The first step is to put a spoonful of sugar, a teaspoon of milk and boiled tea, and a spoon of malai. It is then stirred well and served hot. If you desire for a strong cup of tea, they add a spoon of fresh tea leaves, while pouring the boiled tea, in the strainer to give it that dark look and a strong kick. Mostly it would look like filtered tea that is served at a fancy tea shop. There is a lively history behind this tea stall. Believe it or not a hundred and fifty cups of tea were made and served at a time which impressed me so much since there are so many different steps to get a perfect cup of tea. It definitely did not taste like the regular tea that one drinks every morning. Nearby the tea stall, there was once a college named Tibbia College which has been shifted to Karol Bagh. This college offers education in medicine, and therefore, numerous and frequent doctors, professors, and students would be attending this college. 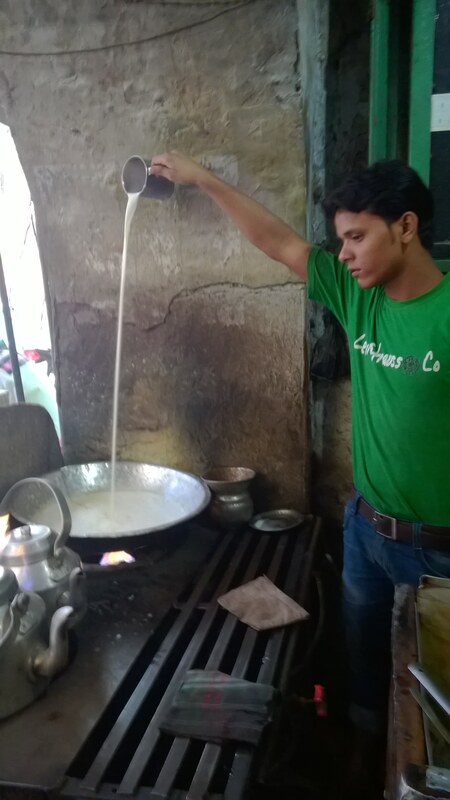 Now a morning without a tea would not be complete and Yahya Tea Stall completed the mornings of a lot of people in the college and around. Tibbia College ordered six hundred teas almost every day, and without fail they were served with the same quality and standard. For a couple of days, the tea stall had been shut down but by popular demand of the people living there and expressing their love for the tea and the family, the stall was back with a bang, serving tea with as much as dedication as it did when it first started. The grandchildren besides being modernized and familiar with the media profession did not leave their ancestral house and believed that living there would keep the culture and history of the place alive. Surprisingly, the haveli that they reside in was once the haveli of Ghalib Mirza’s second wife. It definitely must be exciting to live in a house with intricate Mughal style designed pillars, doors, windows, and houses. Farhan Yahya said that the love and the respect of the people could not make him leave the place where he spent his childhood. A must visit if you want to have a perfectly made hot cup of tea. At the age when most youngsters are looking for a safe and cushy job with a handsome salary, there are very few who are passionate enough to take the bold step to realize their dreams. 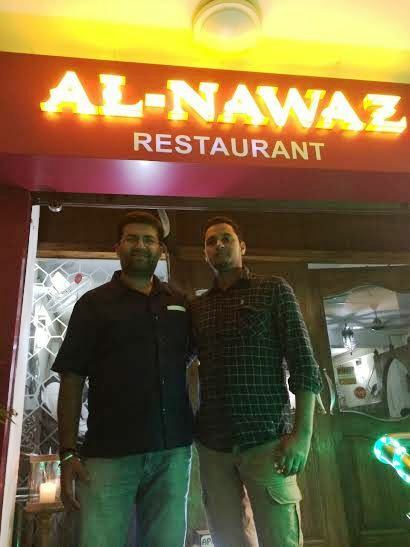 Last week, I met two young, passionate entrepreneurs – Apaksh Gupta of Smugglers restaurant in Hudson Lane and Chef Shahnawaz of Al Nawaz Restaurant in Abu Fazl Lane, Zakir Nagar. In this blog, I would like to cover the story of a man who started his journey, as per his words, from “mummy ke kitchen se Meridian aur Meridian se Al Nawaz tak”. Chef Shahnawaz started his career from Meridian Hotel and left the job in 2010 after getting an opportunity in Melbourne as an Executive Chef. However, due to visa issues, he could not make it to Melbourne kitchen. He was recommended by the owners of Swagat to work in a restaurant in Toronto as the Master Chef. But his mother asked him to work in India and he declined the offer. Then he briefly worked with the Gujrals of Moti Mahal in Chandigarh. With a strong conviction about his art of cooking, he started his second innings with a small degh of 1 kg biryani at Khalilullah Masjid in Zakir Nagar. Our host for the Lucknow food tour, Saira Mujataba, a self confessed biryani freak was regular visitor to Nawaz’s biryani shop in her student days. Believing in luck, Nawaz used to buy basmati rice from a particular shop in Maharani Bagh every time to cook his special biryani. People got addicted to his biryani slowly and in such large numbers that the biryani degh became too small to cook biryani for everyone. He purchased a degh from Jama Masjid but that became small too and finally he ordered a special biryani degh from Moradabad. He graciously admits that, he could not afford nine hundred rupees to buy an iron stand used to take out biryani from the degh and had to compromise with a self made stone stand, which he picked up from the street side. 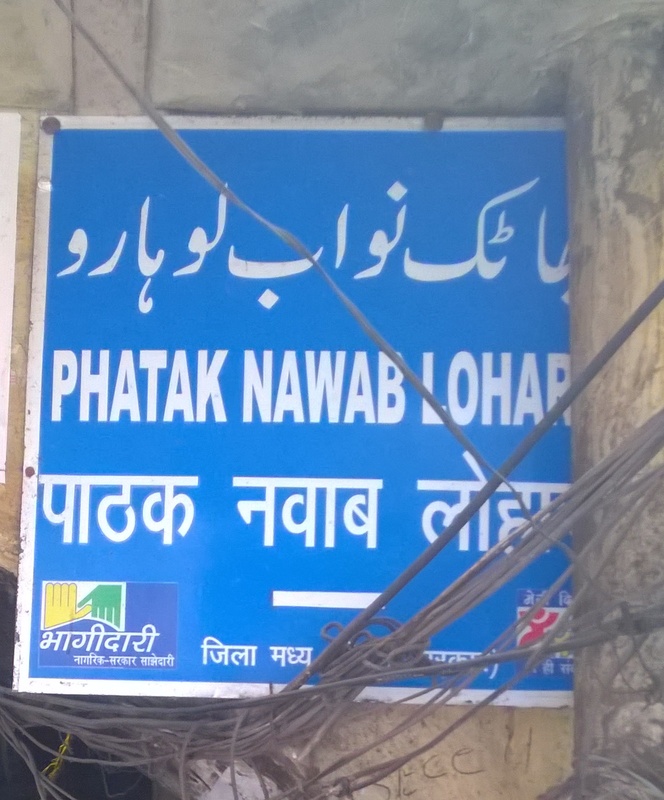 Later he moved to Okhla main road, and opened a new restaurant by the name of Al Nawaz. He claimed to introduce Anmol Chicken, chicken with loads of cream and butter. I went there with another foodie friend last year and found it simply delectable. Soon, his Okhla shop also became quite small and in May 2013, he shifted to the current address in Abu Fazl Enclave, next to Jamia Police station. I had Nawaz’s special kalmi kebab( 4pcs for Rs 270), juicy and succulent leg pieces, mutton burra( 4 pcs for Rs 270), roasted perfectly, big but soft pieces of fish tikka( 5 pcs for Rs 300) and mutton nahari(half plate for Rs 360). 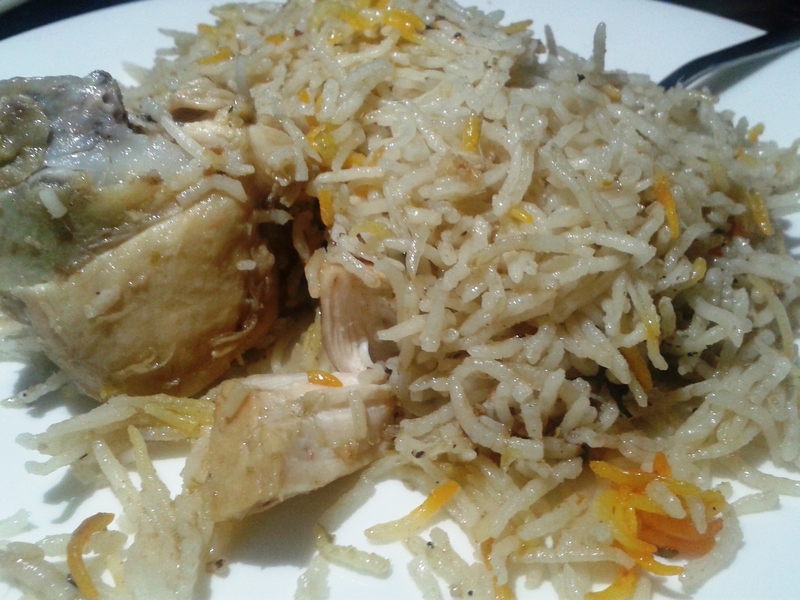 But I liked his Chicken biryani(Rs 250) the most which is served with red spicy chutney. I was told that, many people cook biryani in their homes and visit Al Nawaz especially for the chutney, which works as a salan for the biryani. His biryani has a mix of flavor of Hyderabadi, Awadhi and Kolkata style. I believe this is the reason that his biryani suits everyone’s palate. I am waiting for the day when Jamia Metro Station will finally start functioning and I can frequently visit Al Nawaz for his Biryani. 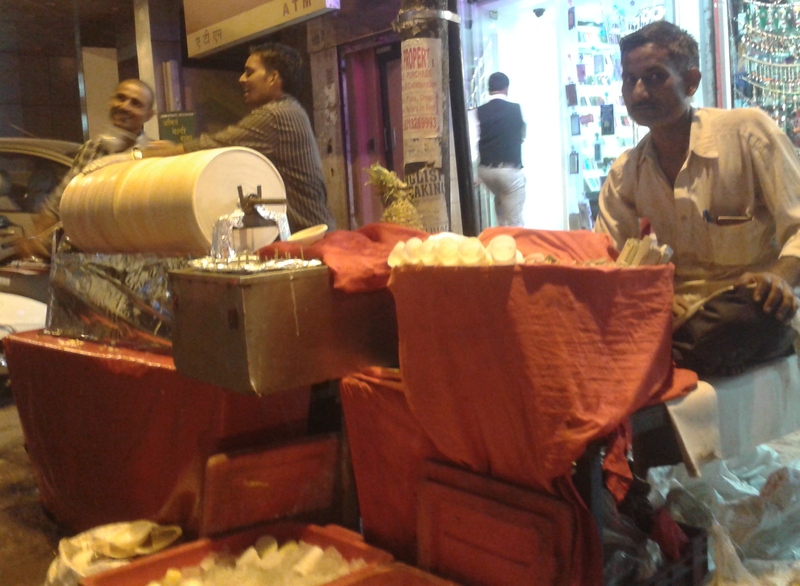 ‘Jugaad’ is the word that comes to my mind whenever I see ‘roller kulfi’ during Ramnavmi celebrations in Old Delhi. It is the only time in a year where one can savour the roller kulfi or disco fruit kulfi, called by many. 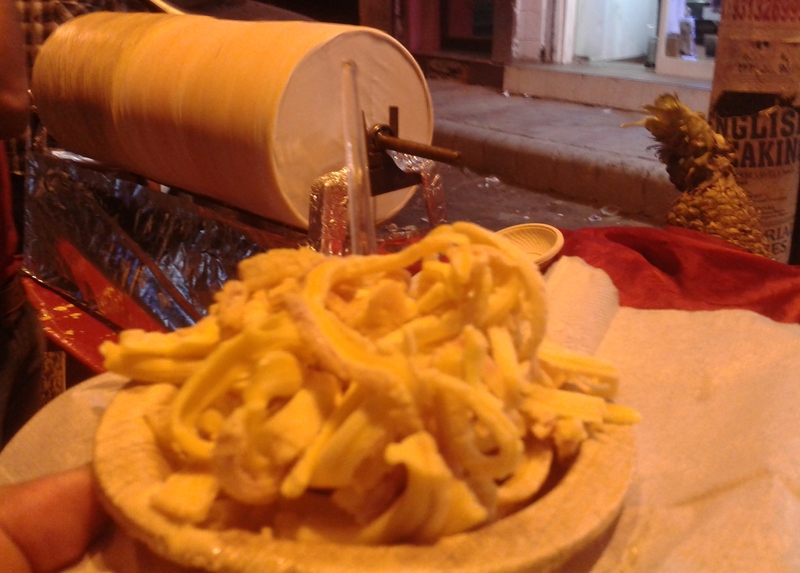 I was delighted, also amazed to see the two roller kulfiwalas in Kamla Nagar, namely, Bablu Kulfi and B.K. Variety Kulfi. You will be able to find them both at Chota Gol Chakkar, near Geeta Mandir. Let me tell you first about the equipment that is used to make roller kulfi. A huge iron cylinder is filled with crushed ice. This cylinder is then put in a stand that has a pedal on one side. It is important to roll the cylinder using a pedal; otherwise the same will melt away. This is taken care of by the two men every time: one who does not lose a single minute to roll the cylinder; and the other who prepares the layers of kulfi by crushing fruits and pouring rabri and milk. All different kinds of fruits – mango, banana, papaya, orange, pomegranate, etc. are added one after the other and interspersed with rabri. The ice inside the roller freezes the juices and with a knife, layers of frozen kulfi are collected in a ‘dona’. The kulfi is fresh and ready to eat before it melts. Besides the fruit juices, B.K. Variety kulfi pours khus and roohafza syrup too. Thus out of the two, I would recommend Bablu’s( 9810246203) as the flavours are completely natural. The freshness of fruit juices with rabri, without added flavour makes the kulfi truly delectable. I believe it should be named as ‘Galaouti Kulfi’ as ‘Galaouti’ means ‘melt-in-your-mouth’ and roller kulfis simply disappear in your mouth. The only thing it will leave you with would be its fresh taste. For all those who missed it during Ramnavmi, this is a last chance to savour the same in Kamla Nagar till Diwali between 5 p.m. to 11 p.m., for only Rs. 50.